In the wake of the Italian elections, this excerpt from ‘Stagioni del populismo italiano’ examines populism in Italy’s political past and present. How did Guglielmo Giannini’s Qualunquismo movement influence the most recent forms of populism: those of the former Prime Minister, Silvio Berlusconi, and comedian-turned-politician, Beppe Grillo? 1946: the Front of the Ordinary Man constitutes itself as a political party. L'Uomo Qualunque/Public domain. Of all the post-war populist movements, Guglielmo Giannini’s (1891-1960) Front of the Ordinary Man (Qualunquismo) was by far the most effective forerunner. His weekly publication made use of relentless puns and twisted the names of his political rivals to mock them, while avoiding discussing their ideas. The progressive jurist Piero Calamandrei become ‘Caccamandrei’ [poo-mandrei], the surname of historian Salvatorelli turned into ‘Servitorelli’ [servile-torelli], Vinciguerra became ‘Perdiguerra’ [lose-the-war instead of win-the-war], premier Ferruccio Parri, became ‘Fessuccio [Fool-uccio] Parri’, the slogan of the Resistance: ‘Vento del Nord,’ [Wind of the North], was vulgarly ridiculed as ‘Rutto del Nord’ [Burp of the North], in the manner of the variety theatre shows that Giannini had attended when he was young. 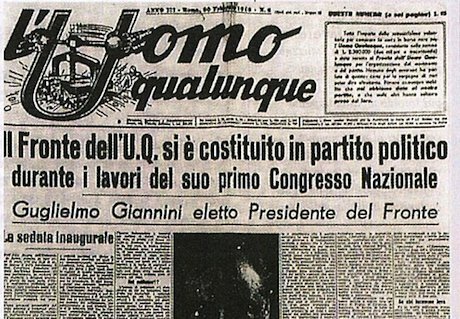 The same technique survives today: the communist press publishes its own satirical column, ‘Fool of the day’ in the official and famous anti-Berlusconi paper Il Fatto, using variations on rivals’ names crafted by lead writer, Marco Travaglio (who used this same style when he wrote for conservative publications). Caricaturing opponents as a way of avoiding their ideas is a tradition that will never disappear from Italian populism, a Grand Guignol cherished by a minority of the public, but which dangerously poisons public opinion. Through his corrosive satirising of his opponents, Giannini inaugurated another feature of Italian populism: the simplification of problems. With its stagnant economy, and unemployment remaining high in the post-war period, Italy – after twenty years of dictatorship, military defeat, destroyed cities and infrastructures and one and a half years of civil war – was reeling. And politicians were seen as the only culprits for not pressing the right button for a perfect ‘reset’ for these problems. Instead of the men in government, Giannini suggested that a simple ‘accountant’, what we might call ‘a manager’, should govern the country for one year, without any possibility of re-election: ‘For a good government, you just need a good manager who will start on January 1 and leave on December 31. And in no way be re-electable’. The ‘crowd’, a term which the ‘Qualunquisti’ [those who identify with l’Uomo Qualunque] hold dear, must not be managed through political vision; it should be governed by a manager as if it were a block of flats or a small business. This rhetoric has trickled down through the ages. The populist debate against ‘The Caste’ - the corrupt and inefficient managing class – over-simplifies, in fact glosses over, the country’s very real problems: a lack of innovation, crippling public debt, failing schools and universities, a plethora of businesses that are too small and family-run, and a shortage of credible international players with a few exceptions such as Eni and Fiat. Just to name a few of Italy’s troubles that are never cited - lagging behind in productivity, organised crime, a debilitating North/South gap, the digital divide: the evil is in the ‘Caste’, the wastefulness and costliness of politics. If only, the lament goes, we could ‘send them all home’ (them being the corrupt politicians) - Italy would experience a re-birth. Silvio Berlusconi, who won the 1994 elections and became Prime Minister (and in the European elections of that same year took one third of the vote), presented himself as just that manager; the one who would be capable of solving all these problems not as a ‘politician’ (a designation he has never acknowledged, not even after two decades in Parliament) but as a manager and businessman. In 1994 post-industrial Italy, Giannini’s ‘accountant’ had become a big business ‘entrepreneur’. But the populist techniques, and their successes in the national political elections of 1994, 2001 and 2008 and in countless local administrative elections, remained undiminished. Another surviving element of Giannini’s Qualunquismo is the liberal-friendly propaganda and the hatred towards the multinational and developed industrial world. Giannini preached ‘The Word’ of superficial laissez faire; in his opinion the strings that ‘politics’ impose on the ‘economy’, hinder the country’s development. But this generic liberalism was accompanied by tiresome propaganda against fat-cat companies – the ‘masters of steam’, the industrialists who then dominated the big groups of the Turin-Milan-Genoa metropolitan triangle. The Lega Nord Party, a northern movement founded by Umberto Bossi, was the most direct heir of this populist seam mined by Giannini. For the Lega too, economics need ‘freeing’, and even Bossi (referred to in the Lombard dialect as ‘il Senatùr’, the Senator) with his typical popular witticisms, was initially inspired by liberal ideas that seemed to scorn the rules imposed by the politics of a ‘Roma ladrona’ [thieving Rome] on the north. A north that was Italy’s goose with the golden eggs (as a famous Lega Lombarda poster described it). At the same time, however, Bossi, his newspaper and his radio stations were strongly critical, making extremely barbed political polemics against the big industrialists, especially Turin’s Fiat Group, which was accused of prospering through political connivance at the expense of the small family-run enterprises so close to the Lega. The last Qualunquismo trope which has survived to our time is the use of stylistic elements gathered from variety shows, frivolous movies, gossip weeklies, even sport commentary twisted into political debate, turning everything into a grotesque ‘us against them’ match. This is a light, lively, captivating formula for political discussion which, when taken from Giannini’s weekly format and projected into our era’s mass communication network of TV talk shows and web blogs, takes on a new, explosive, viral, dimension. Berlusconi’s twenty years of political presence and the counter-propaganda of his more radical rivals would see over-simplification become the norm and annihilate the possibility of any serious debate in Italy. If the fans of the former Prime Minister celebrated his ‘taking the field’ in politics in a typical sportsman’s style, anti-Berlusconians would use the football jargon ‘we was robbed’, just like the fans who attribute their defeat to the corrupt referee, rather than their own shortcomings. The presence of female candidates characterised by flamboyant (and scant) styles of dress were frequent in Berlusconi’s political line-ups, especially in the last legislature, and accentuated a phenomenon that would have provoked Giannini’s pen: right wing populist representatives, like Member of Parliament Daniela Santanchè raising a middle finger to protesters, and radical anti-Berlusconi activists deploying vulgar photographs of female rivals. The break-up of the traditional parties was, however, insufficient to convince voters that the left was mature enough to take on the leadership of the country, especially led by a former PCI member like Occhetto. In those years, an expert in politics, Giuliano Urbani, worried by the vacuum that was, in his view, opening up in the moderate and conservative area, asked Fiat’s President, Gianni Agnelli to run for the premiership. Agnelli replied that this wasn’t his role and suggested that Urbani ask the founder of Mediaset, Silvio Berlusconi. Berlusconi, a property developer in Milan and creator of private television channels with Mediaset and Canale 5 (thanks to the political support obtained from his friend Bettino Craxi) had for some time been aware of polls that registered his popularity with the public, thanks in part to the victories achieved by his football team, AC Milan. Berlusconi delegated the work of building the party to people from his Publitalia advertising company; people who were perfectly acquainted with the mood and spirit of Italy’s economic elite in the cities and provinces, and entrusted his right hand man, Marcello Dell’Utri with the creation of a group of candidates. Many came directly from the ranks of Publitalia management and were to have political success: Enzo Ghigo, President of the Piedmont region; Giancarlo Galan, President of the Veneto region; Gianfranco Micciché, leader in Sicily and a Member of Parliament in Rome. The power of the populist masquerade that followed the 1994 victory led Umberto Bossi – another great figure of Italian populism – to fear that Berlusconi could steal his northern electorate, thereby cutting the Lega‘s lifeline. Berlusconi’s first government went into crisis and, after an interim government led by former banker Lamberto Dini, the elections were won by Professor Romano Prodi, an independent economist, Catholic and a reformer who had led the public company Iri and had been a minister in a Christian Democratic government. Prodi’s hopes of reform lasted a little over two years – but a series of governments guided by Massimo D’Alema and Giuliano Amato and the candidacy for the election of Francesco Rutelli again paved the way for Berlusconi in 2001. The public was disappointed in the left and, although its enthusiasm for Berlusconi was not what it was in 1994, when many had hoped for a new type of politics, it decided to vote for him again. At this point, the polarisation between the right and the anti-Berlusconi left created a situation in which no moderate, from any camp, could take the stage. TV talk shows hosted by Michele Santoro, a popular left-wing anchor-man, and the attacks on Berlusconi no longer led to a tense debate on the national economy, but rather to an extension of the violent conflicts between politicians – almost always the same ones – who, like actors in a western, took verbal pot-shots at each other during the shows, only to go back to polite discussion when the cameras were turned off. Politics was reduced to an exchange of scathing remarks on TV shows, with not a shred of reasoning to contribute to any proposals; this attitude infected the newspapers who took each other on like gladiators, from pro- or anti- Berlusconi camps, with the best journalists on the right and on the left fighting it out in articles that, although brilliant in form, were devoid of substance. Lost in this yah-boo carnival, the country did not realise that this was the last possible chance for economic reforms, the reduction of the public debt (almost 2,000 billion Euros), for a shared reform of pensions and welfare; the last possible opportunity also to attract capital from abroad before the financial crisis of 2008 would shake the economy to its core and, as a consequence, unleash a European debt crisis that would dash any hopes of rapid growth. In the 2006 elections, Romano Prodi, back in politics after directing the European Commission, managed to repeat the 1996 success, but with a narrow majority at the Senate. In the meantime, the populist rebellion raged on, lowering the level of debate further, since now they didn’t just limit themselves to puns on surnames, as in Giannini’s time, but included gossip on personal and family life and private mores. The two sides reciprocally accused each other of populism. The left accused Berlusconi of gaining votes through his sole control of TV channels Rai and Mediaset and covered him with insults, disparaging his Nabob-like lifestyle and his court-like circle of friends, actors and colleagues. The right replied through the Berlusconi stable of newspapers (to comply with antitrust regulations Berlusconi gave his brother Paolo control of the newspaper Il Giornale, founded by Indro Montanelli, and his wife Veronica Lario part of the ownership of newspaper Il Foglio, founded by Giuliano Ferrara) and TV channels, tarring rivals with innuendo and gossip. The emergence and increasing use of the internet and the birth of gossip sites online – whose ownership was, unlike TV and newspapers, not transparent due to a gap in antitrust laws – allowed anonymous writers to harass their rivals through a crescendo of slander, insinuations, photos snatched by paparazzi and obscenities; which the press would often reproduce in ways that lowered the level of debate to a degree of squalor never before achieved in the history of the Italian Republic. The background noise of a debate reduced to gladiatorial combat, often paid for by their political sponsors, was deafening for many Italians. And when Romano Prodi was forced to resign and Italians went back to vote in 2008, Berlusconi’s third victory revealed itself to be a hollow one. The economic crisis which burst with the bankruptcy of Lehman Brothers in the autumn of that same year demanded increases in rigour, austerity and reforms that would really transform the lifestyle and work habits of Italians, as they had emerged from 1945 onwards. Beppe Grillo and The 5 Star Movement borrow directly from Giannini’s repertoire: political controversy as a transformation of the show into a rally, a genre in which Silvio Berlusconi – especially when in front of a camera – has been shown to excel. Grillo, with a high school Diploma in Accountancy (which brings us back to Guglielmo Giannini, who believed a simple accountant would suffice to lead the country), was a comedian who had great success. He worked both for the public television channel Rai and Silvio Berlusconi’s private network Mediaset, as well as in the movie industry and in theatres. After first taking a political approach on environmental issues (Grillo believes that genetic engineering and particularly GM food is harmful), the former actor entered politics on the issues of corruption and complaints against the ruling class. His blog, presented to the American public in an interview for The New Yorker, and included by Forbes in their list of the most popular websites, draws the attention of thousands of citizens, including many from the younger generations, by denouncing their rivals in a typically sarcastic, populist tone. The hyper-simplification of problems is brilliantly conveyed by the ex-comedian, because on stage (one of his first performances was called ‘Vaffa Day’ [F**k off Day], from a common, everyday Italian swearword) he can reduce any economic difficulty into a witticism, a slogan or a joke. (As a matter of fact, Berlusconi, who recognised his comic talent as a television tycoon, loved to open every political meeting with a joke, even exporting this habit to G8 and G20 meetings, hardly to the amusement of the other leaders.) His online economic programme, for example, in one of its first appearances, required ‘the elimination of the Chinese boxes’, which meant the complex system of reciprocal control by which Italian companies are governed (often with minority shares) by astute financiers; a crony capitalism, where what counts more is the ability to weave one’s own network of relationships, not one’s productive or innovative capacity. This has caused serious damage to the Italian market, and for a long time people tried to limit its harmful effects, but in vain. Reforming ‘the Chinese boxes’ means remodelling Italian capitalism and its property structure, a necessary reform that involves deep economic, juridical, financial, labour union and social interventions. Solving it with the line ‘abolish Chinese boxes’ has, of course, an immediate appeal for the public, especially for the more naive, young or angry. The risk, however, is that it will scarcely be effective in the real world, where legions of attorneys and managers will slow down the speed of such reforms. Beppe Grillo also requires the purity of candidates, for example requiring that they have never been criminally convicted, (as he himself was convicted for a tragic car accident where two of his friends and their 9 year-old son died, he says he will never become a candidate). One by one he chooses their biographies via the web. At some point in his journey, Grillo met Gianroberto Casaleggio, an entrepreneur and expert in communication strategies and the Internet. The comedian, who used to break computer screens to amuse his audience, then became a digital leader and managed his campaign from there. In 2012 he won the elections for the Mayorship of Parma with the Movimento 5 Stelle, and later, in a classic case of populist leadership, made a physical display by announcing he would swim across the Strait of Messina from Reggio Calabria to Sicily, before the local administrative elections. Grillo had already given a sort of public interview on the beach, with flippers and diving mask, speaking with other bathers. The leader’s body becomes a joke, a game, a witty allusion – and the populist paradigm is confirmed in full. The 2013 pre-electoral surveys guarantee Beppe Grillo a maximum of 20 per cent of the vote, a result that has no precedent for a newly born political force, other than that of Berlusconi’s ‘Forza Italia’. With the party founded by the ex-Public Prosecutor of the Mani Pulite Inquiry, Antonio di Pietro – Italia dei Valori – and with the Sel left-wing movement of Puglia’s President, Nichi Vendola, the forces against the current status quo could even (on paper) reach an absolute majority, although Vendola seems more inclined to a centre-left alliance with Pierluigi Bersani's Democratic Party. These are a patchwork of forces and it would be a mistake to homogenise them all into one form of digital and post-industrial neo-populism. Yet all of them feature the classic elements of populism and all of them flirt with populist issues in their propaganda: including Di Pietro himself, who remembers his past as a worker, emigrant and policeman, and loves to be caught by photographers driving a tractor while looking after his farm. This pamphlet excerpt is part of an editorial partnership with Counterpoint launched in a guest week in November 2012. The partnership will continue over the coming months with articles timed to coincide with events to disseminate the ten pamphlets commissioned through Counterpoint's project 'Recapturing Europe's Reluctant Radicals', funded by the Open Society Foundations.